Introduction to splunk on splunk - "This website is not affiliated with Splunk, Inc. and is not an authorized seller of Splunk products or services." What is SOS- (splunk on splunk)? Splunk on splunk is a splunk app which provides graphical view of your splunk environment performance and issues. 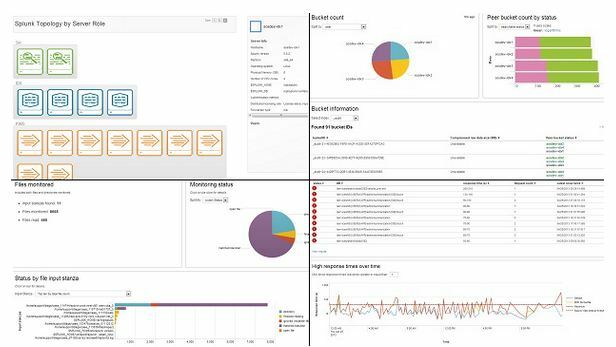 Sos used as diagnostic tool to analyze and troubleshoot problems in your Splunk environment.It’s kind of self-troubleshoot program which analyses its component performance issues and reports them to admin. - View, search and compare Splunk configuration files. -Monitor scheduler activities and issues View details of scheduler and user-driven search activity. - Analyze data volume metrics captured by Splunk. - Where should SoS be installed? The SoS app should be installed on your search-head. - What if I have more than one search-head? SoS can only analyze and report on Splunk instances that it can reach by means of distributed search. Unless you have a federating search-head for which the other search-heads are declared as search-peers, you should install SoS on each search-head that you wish to gain introspection on. - What about search-head pooling? Any extra steps I need to take to install SoS on a search-head pool? You will almost certainly need to manually restart Splunk on the pool members other than the one where SoS was installed from the user interface in order for all pool members to become aware of the app. - Are there any requirements for SoS to work? The SoS app depends on the UI module library of the Sideview Utils app. Make sure you install SVU (minimum version required : 1.17) prior to SoS. - Does anything need to be installed on the search peers? Optionally, you can install the SoS technology add-on on your Unix and Linux search peers. This add-on provides scripted inputs that track the resource usage (CPU, memory, file descriptors) of Splunk. - Do I also need to install the SoS technology add-on on the search-head? No, that would be redundant. The SoS app ships with the same data inputs than the technology add-on. - What do I need to do for the SoS data inputs to track Splunk resource usage? By default, the data inputs for SoS and SoS-TA are disabled. They must be enabled in the UI (look for ps_sos.sh and lsof_sos.shin Manager > Data Inputs > Scripts) or from the command line (refer to the README file for more information on this) before they can report resource usage information. - What if my search-head is configured to forward data back to the search peers? Any action required for the SoS app to work in that scenario? - What about my heavy forwarder? Can SoS query and report on it? Yes. Please see this Splunk Answer for details on how to achieve this. - How can I make sure that SoS reports accurate license usage information in the Metrics view? 1. Make sure to install SoS on the search-head that acts as a license master, or at least that the license master's _internal index can be accessed by distributed search. 2. [Splunk 4.2.x only] Make sure to enable the scheduled search named sos_summary_volume_daily in Manager > Searches and Reports. This search populates the sos_summary_daily summary index, aggregating your license usage on a daily basis. Note: You do not need to perform steps #2 and #3 if you are running Splunk 4.0.x/4.1.x or 4.3.x. How can I monitor the resource usage of my forwarder using the S.o.S app? /! THE FOLLOWING INSTRUCTIONS ARE ONLY VALID FOR SOS 2.2 AND NEWER /! In SoS 2.2, the "Server to query" pulldown present in most views and that lists instances reachable by distributed search will load from a lookup file "splunk_servers_cache.csv", refreshed at 5-minute intervals. This will considerably speed up the population of this omnipresent pulldown. It also means that you'll be able to scope S.o.S' views to events in the _internal index (or in other indexes, by updating the appropriate macros such as set_internal_index or set_sos_index) accessible by distributed search and belonging to any host, without the need for that host to be a search peer. · sos_server : This should be set to the value of the "host" field with which the events for the particular server are tagged. · server_role : A description of the role of the server. Typically, this should be "search-head", "search-peer", "standalone indexer" or "forwarder". 1 - Install the SoS technology add-on for Unix and Linux on the forwarder whose resource usage you care to monitor. The hostname of your forwarder should be among the values returned. · The value of the "host" field for your forwarder's events in the sos index, as you gathered it in step #3. · The string "forwarder", which will label that host as such in the "Server to query" pulldown. 5 - The "Server to query" pulldown in the "Splunk CPU/Memory Resource Usage" view should now list your forwarder and enable you to view its system resource usage.